Click Here to read an excerpt from the workbook. Please Note: Parent Educators should order the companion Facilitator's Manual Download. This workbook is also available in the discounted Parent Study Package. For years we have wanted to create a Positive Discipline Workbook. However, I did not want it to be a boring, fill in the blanks workbook. Then I discovered Diane Durands illustrations and felt inspired to finish the project in a different way. Each lesson in this Positive Discipline Workbook is filled with illustrations to capture your interest and tell the Positive Discipline story better than words alone. Experiential activities and parenting tools are included in each lesson. In the first lesson you will learn what to do when your child wont listen. You'll also learn what happens when your buttons are pushed. 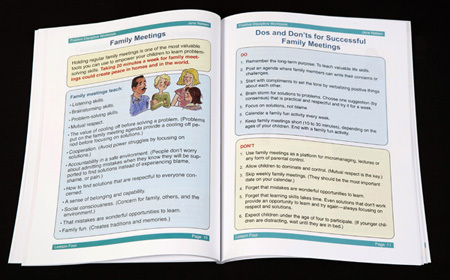 The Positive Discipline Workbook book can be used by a parent educator in a parenting class setting or for self-study. 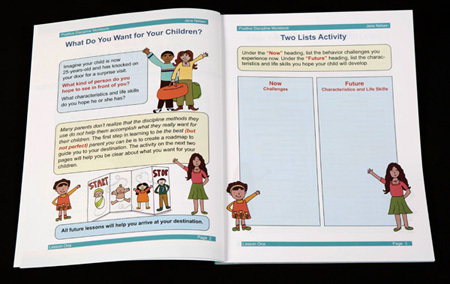 The workbook is designed to be used with the Positive Discipline Book and the Positive Discipline Tool Cards. You can order these items together in the Parent Study Package. I just wanted to share that I am so excited to have your workbook! It is so readable and doable for parents who are busy. I find parents are reading less and less and to read the PD book is a stretch for most people (sadly) but the main points are brought out so wonderfully in the usable format of the workbook. Thank you!